A major goal of conservation genetics is to determine which specific populations are most crucial for in situ or ex situ conservation. 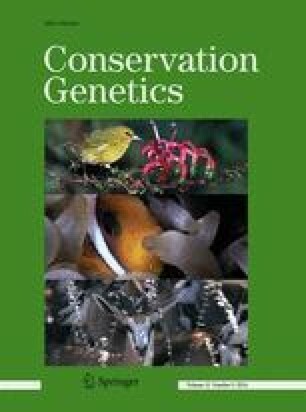 Genetic divergence and diversity are the two foundations by which priorities for conservation are typically determined. However, these measures may be confounded when past bottlenecks reduce genetic diversity of populations but also lead to their divergence. This study examines the potential conflicts in population prioritization for a relictual Japanese endemic conifer, Sciadopitys verticillata using nuclear microsatellites. High genetic structuring at the nuclear level compared to many other conifers (Fst = 0.129) was observed across the species range along with significant differences in genetic diversity between southern and northern populations. Conflict among genetic diversity and divergence population prioritization methods was observed in populations at the southwestern range edge of Kyushu and Chugoku, which were the most genetically distinct but also harboured the lowest diversity (Kyushu, He = 0.288, Ar = 2.172, and Chugoku, He = 0.222, Ar = 2.010). These populations contained only a subset of the genetic diversity found in Central Honshu and the Kii Peninsula (Central Honshu, He = 0.347, Ar = 2.707 and the Kii Peninsula, He = 0.337, Ar = 2.683), suggesting a reduction in genetic diversity as a result of bottlenecks. To determine if these highly bottlenecked populations in southwestern Japan are on the trajectory to extinction, or, conversely, if they harbour important genetic variation that has been fixed at the southwestern edge of the species range, common garden experiments are recommended in the future. The online version of this article (doi: 10.1007/s10592-014-0615-y) contains supplementary material, which is available to authorized users. The authors thank H. Ando, S. Harasawa, Y. Hatanaka, D. Kawase, T. Mizuno, L. Mizusawa, T. Oda, S. Sakaguchi, M. Suzuki, and Y. Yamazaki for assistance in the field, and K. Ohba for valuable advice on this study. We also thank Mizuno Tadakuni of the Wakayama prefecture government and Nakamori Yumiko of the Wakayama Prefecture Museum for help with sampling in Wakayama Prefecture. Lastly we also thank the Field Science Centre for Northern Biosphere, Hokkaido University, Kyushu University Forest- Seto Regional Forest Office, Kiso Regional Forest Office, Mima City Government Office and the Omogo Mountain Museum for sampling assistance and permission. This research was supported by a Japanese Society for the Promotion of Science research fellowship awarded to JRPW and by the program of the Global Environmental Research of Japan (S-8), the Ministry of the Environment.